Before I ever sold any rebounders, I wanted to know what the differences were. Every company said they had the best one. so firm that it hurt my knees. springs when I tap on them with a spoon. (I even bought a guitar tuner and sampled each spring. body. Having just the right bounce with enough bottom time and less "air" time will be the rebounder of my choice. Send your questions here and they'll be posted here with responses. Which is the best rebounder if one is over 300 lbs? The Cellercsier and the hard bounce model has the strongest springs that can handle the most weight that I have tested. What makes a good rebounding suspension? First thing that comes to mind is the quality of the steel. An alloy with carbon is ideal for longevity and wear resistance. Always get the lowdown, you can avoid a $100 spring set replacement fee if you stay vigilant. Barrel-style springs will wear the quickest and represent the bottom of the barrel as it were, tapered(oblong form) springs mitigate some stress, but tiering a tapered design will not only up the longevity factor, but fix some of the two formers' issues with jarring and even noise. Bungees are fantastic fun and I can't dis-recommend them, but they don't deliver precision in the bounce. You mentioned that unibody isn't necessarily the best frame construction. How can a frame be more rigid if it's in pieces? Generally, folding frames can't match a unibody's rigidity, provided that the unibody in question is torsionally sound. Models that are articulated for travel and portability have engineering afterthoughts for hinge hardware. Exceptions can be found by holding the frame and both sides of the hinge with your hands when the structure is deployed. If there is noticeable play in the mechanism, that means there will be impact occurring at that point and over time, the structure will surely fail. You can have quality in a folding frame, but you will pay extra for the engineering quality, however, compared to replacing a frame, the premium over the low tech pays for itself. Do they use canvas mats? Avoid canvas mats. The new state of the art is Permatron, which is made expressly for this kind of application. Canvas mats stretch, even rot and mildew. A stretched mat will throw you off balance and cause injuries. What kind of surface should I place my rebounder on? Any even, flat surface like a floor, deck or patio(i use my garage) will do. It's important, also, to consider the leg and foot construction of the unit you're using. The feet are commonly rubber, which can scuff heavily and wear out quickly, the state of the art is polymer feet with a metal washer inside to keep the leg tube from chewing into the foot. How often do springs need replacing? Ideally never, the highest quality carbon steel springs with optimal taper and tiering will not need replacing if they're made correctly. Alert: If a dealer tries to sell you an extra set of springs with a new rebounder, beware they probably won't be the last extra set you'll have to buy. Also, look for construction that isolates the springs from the frame with a pin or some kind of subframe: otherwise they will eventually wear or scrape away at the frame, causing rust or other damage. Newer questions answered about rebounders. Q. Why do some rebounders require you to change the springs every 2 years and not others? A. Because they stretch out from weak grade steel. They can look the same and perform nearly the same in the beginning. After 3 months is when most people complain about their rebounder when they notice the stretching. Q. Which rebounder is the best for over 200 lbs.? A. One that supports you and designed to support this weight or can adapt to this weight. Q. Whats the main thing to look for in a quality rebounder? A. 1st, the mat and the spring structure... 2nd, the frame integrity and welding...3rd, the supporting parts- rubber feet and spring covers. Q. What happens if I sweat on the rebounder or leave it outside in the rain? A. Some can rust and others don't. On high-end rebounders, they don't rust but oxidizes. Example: Oxidation is when a car paint changes color but doesn't rust. A good quality electroplated painting protects against rust. Q. Why does my rebounder squeak so much? A. Oil it silly! Good quality steel will squeak more than low quality steel. There is more friction potential. Always oil both ends of your springs so that the springs will not fatigue. Fatigue causes the spring to heat and cool repetitively which causes the spring to become weak and break. Q. How do I know which springs should be replaced without replacing them all? A. See spoon test. Or buy a better spring set from the start. Q. Will the rebounder quality diminish after a few years? A. Some will and some won't. A better quality rebounder should last 20 years. Cheaper ones need to be replaced every few years. Q. How do I clean my rebounder? A. Hose it off if it's water resistant but if not, then wipe it with a damp towel. If you don't dry a non water resistant model, the corrosive elements can make it rust. Near the beach, hose off a rebounder once a week if left outside. Electroplated models don't need to be dried off. Q. Is a plastic frame or metal frame better? A. Metal always. Common sense. Q. Are heavier springs better than lighter springs? A. This cannot be answered this way. It depends on the component material of the springs. Q. Why is my rebounder making black marks on my rug? A. Cheap rubber tips can wear down faster. That is all it is doing. A. Mold resistant spring covers are usually the water resistant type. Canvas types mold quicker. Anytime a rebounder can hold dampness, it can mildew and mold. Q. What do I do to prevent paint from chipping off my rebounder? A. Get an electroplated paint and avoid a powder coated paint that flakes. Q. My rebounder springs have stretched and its only been a year. Why is this happening? A. Cheap steel springs are almost always the cause or they weren't rated to the weight of the user. Q. 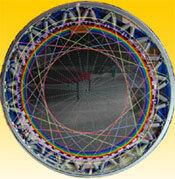 My rebounder is wobbling due to something that has caused the frame to warp. Why? A. This is usually from an inferior quality frame that has had poor quality control. Always check your rebounder when you get it to make sure the legs are evenly supported on the ground. Many people have to duck tape one of the legs to keep the rebounder from wobbling. Q. Can a mat rip when jumping on it? A. A good quality mat made of Permatron will not rip like nylon or canvas or plastic mats. An inferior mat will tend to throw you off which will let you know the mat has stretched or weakened. An inferior mat will not support you properly which is why it will throw you off. Any rebounder should be capable of helping to drain the lymphatic vessels and clear the lymph nodes. By doing things to get rid of the acidity in the body and manually squeezing each of the one way valves to empty out the wastes, the process should go faster. Joint pain and circulatory issues are usually the sign of this not working. I always ask if people have weak ankles and knees. This is not because of an injury usually, but from major acidity in the joints. 1. Will not invert you ankles, even when jumping in the middle or putting one foot on the edge and one foot in the middle. 2. Will give at least 3 g forces that is usually enough force to flush the thickest, viscous stagnant lymphatic waste. 3. Will not jar to allow deep breathing without jarring the lungs. (The rib cage plays a big role in pumping lymph. Shallow breathing while rebounding makes rebounding much less efficient. 4. Will give quicker G forces, NOT LONGER G FORCES. Softer or deeper bounce rebounders can feel great to jump on but if there is not enough g force to TOTALLY """CLOSE""" A ONE WAY VALVE IN THE LYMPH VESSEL, THEN NOTHING FLUSHES. You can get a great workout but not a lymphatic workout. Take for example a stationary bike, you burn calories but not enough G forces on the whole body to give the body a lymphatic flush like a rebounder. 6. If scraping the sweat off your body with a shimmy and put into a cup, their should be a larger amount of oily residue than the sweat you normally get from being outside in the sun or walking on even pavement. (You can put the cup outside in the sun and see what the filmy residue looks like after the water has evaporated. 7. If bouncing a bowling ball on the rebounder, the bouncing on the edge should be a linear proportion increase of the center of the rebounder. Inferior rebounders have a very firm outer edge and a significantly softer center spot which can throw you off. Remember, you either are DOING THE HEALTH BOUNCE OR YOU ARE NOT. THERE IS NO GUESSING IF YOU ARE DOING IT. Therapeutic Rebounding can be therapeutic for short periods of time (2 minute sessions) but it should never be done for longer times when starting unless you are prepared for digestive problems, organ failure, colon build-up, joint calcification, and metabolic imbalances. More in-depth information can be learned in our rebounding consultations. Available from 2pm to 6pm. One on one. Schedule your consultation. Based on availability, please.